Recently we had a new toilet installed during the great bathroom remodel of 2011. It's a nice toilet, as far as toilets are concerned, but it had this quirk where the handle would just stay down after flushing. All you needed to do was lift it after flushing and you were good to go, but it was a rather irksome inconvenience. Around the same time I was reading The Lost Symbol, by Dan Brown. There is a lot of talk of Noetic Science in the book and it got me thinking. 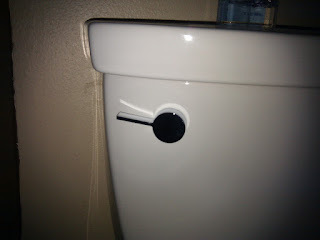 So, rather than actually fix the toilet handle, I just thought really hard about fixing it. Well guess what suckers, it's fixed, and I did with my mind. I think there are some obvious take aways here and probably best if I point them out. 1. I can do things just by thinking about them. 2. I could probably mess you up just by thinking about it. 3. My wife should be cognizant that when I say, "I'll get to that" ... I might very well be already doing it. Getting Your Nintendo to Work!! !